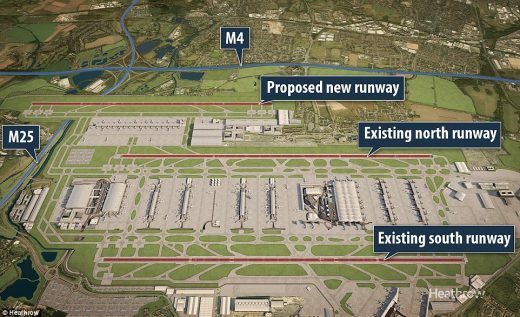 It is looking increasingly likely that a third Heathrow runway will be added to the airport as part of a £17bn expansion plan, reports BuildingTalk. How close is the new runway to this well known British Airways HQ office development by the Norwegian architect Niels Torp? While the Airports Commission has backed the plans – saying that it will add £147bn in economic growth and 70,000 jobs by 2050 – the expansion has faced strong opposition due to the obvious environmental ramifications. The construction of a third runway will also see the demolition of 783 homes including most of the neighbouring village of Hardmondsworth. The Waterside building in Harmondsworth, London, is the international head office of British Airways. The building cost £200m and is located on Harmondsworth Moor, northwest of Heathrow Airport, between the M4 and the M25 motorways. 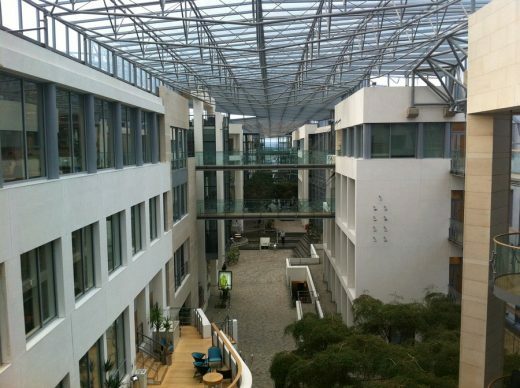 The BA Headquarters building includes six sections backing onto a 175-metre (574 ft) glazed atrium street; each section represents a continent served by British Airways. Each section has a different theme based on the continent. For instance, Cherry trees are planted in the Asia-themed section, Eucalyptus trees are planted in the Australia-themed section, Birch saplings were planted in the Europe section, and Hardwood saplings are planted in the North America-themed section. The six limestone-clad four-storey horseshoe-shaped sections all back on to an internal ‘street’ that runs inside an atrium. The street is paved in granite slabs and cobblestones, has bridges which cross it overhead, linking the individual buildings, and is looked over by balconies which lead off the bridges. This concept can surely be traced back to Herman Hertberger’s Centraal Beheer in the Netherlands. Later is was developed further by Michael Laird Archietcts with RHWL at the RBS Head office in Gogarburn, Edinburgh, Scotland. The street houses a health centre, hairdressing and beauty salon, travel centre, Waitrose supermarket, bank, restaurants and cafés and a 400-seater auditorium. Waterside has a 9,000 sqm (97,000 sqft) gross internal area. The building contains mostly open plan offices; no personal space is assigned, although enclosed areas are available for meetings and study. Waterside is easily accessible by the courtesy BA shuttle bus. Please note that you must show the bus driver a copy of your invitation email to be allowed to travel on the BA shuttle buses. Please bring photographic identification i.e. passport or driving licence to show our Security personnel. Waterside is on the western edge of London, near West Drayton and Uxbridge, in the Borough of Hillingdon. Parking is very limited and is reserved only for those with mobility issues. There are several courtesy buses that can take you to Waterside either from Terminal 5 or Hatton Cross underground station. The BA5 runs approximately every 15 minutes from Terminal 5 (bus stop 21 located outside arrivals entrance). The BA1 runs approximately every 20 minutes from both Terminal 5 (heading towards Westbase) and Hatton Cross underground station (heading towards Cargo). The Park and Ride runs approximately every 10 minutes from Hatton Cross underground station.